So y'all know Albert Pyun, right? He's made pretty watchable B-movies over the last several decades for a number of low-rent producers, and gained a bit of notoriety in recent years for selling never before seen Director's Cuts of his films via Myspace and the like. As much as I'd love to see the original, intended cut of the bizarre Van Damme Sci-Fi vehicle Cyborg, Unfortunately, I just couldn't bring myself to spend $30 for a DVD-R copy of what's literally an old VHS workprint. 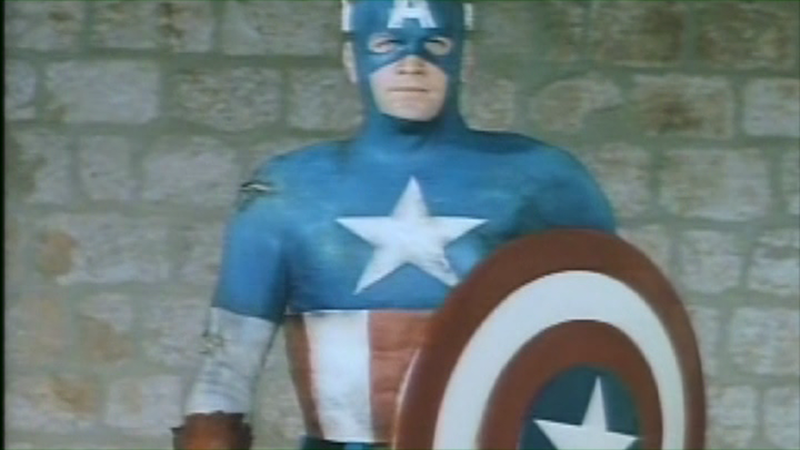 So when it was announced that between July 4th-July 15th he'd be selling an exclusive Director's Cut of his 1990 CAPTAIN AMERICA film I couldn't help myself. Word is funding was cut severely days before shooting, so being the low-budget trooper Albert Pyun took his resources of virtually nothing and tried to adapt the epic comic-book origin story anyway... the inevitable result can, more or less, be viewed below. Yeah, it was literally $34 for a goddamn BD-R and perhaps the single funniest cover in the history of anything, but I just couldn't help myself. I'm actually pretty excited to see what a 20+ year old 35mm workprint looks like in 1080p, so when it arrived I excitedly tore the box off and popped it in...only to find that the my disc is full of read errors and won't even play. Sigh. I'll obvious hold off on any sort of official judgment until I have a working Blu-ray in hand just in case, but this is not a good start. For the love of Apple goddamn Pie, the entire DVD has been BOB deinterlaced!? How the hell did he even... argh!! F.Y.I. - Contrary to initial reports, the Director's Cut is 104 minutes, NOT 124! And of that, the first roughly 4 and a half minutes is a blank screen. I wish I was joking.